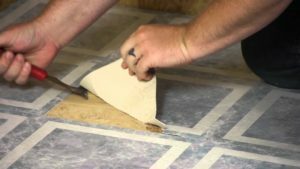 Vinyl flooring removal is a time-consuming and labor intensive job that will payoff, if you stay the course. It’s not necessarily complicated but it is time-consuming and requires a lot of hard work to get it done and the right results without causing unintentional damage. It’s easy to cause damage to the subfloor when removing vinyl, usually due to the glue and tools used to pull it up. Not to mention the fact that you’ll need to rent a few tools you might not be familiar with using. Start in the corners. The corners are the place to begin when it comes to taking up vinyl flooring. Once you have the corners up, the rest of the job becomes a bit easier. Take the time to deep clean the subfloor. Sweep the floor thoroughly and then use a shop vacuum to clean up any loose remnants. If adhesive still remains on the subfloor, you’ll have to go ahead and repeat steps above, as necessary to finish it right. Once you’ve taken up all the vinyl flooring, just phone 800-433-1094 or visit Junk Garbage Removal.